You may laugh. I certainly did. Would you believe, after playing around for the past week on what I assumed would be my new and improved hot cross bun recipe, I finally decided to refer to a post written a good number of years ago, only to discover that the new recipe, is almost identical to my old recipe! Quite the coincidence, considering I started the most recent one, completely from scratch. The differences are mostly minimal; I believe the ratios are roughly the same, but even so, I feel it warrants a new post. Also it gives me an excuse to update my blog, after what seems like an eternity of silence. Somehow over time, I’ve managed to bake more and travel more, but blog less. So here’s my attempt at readdressing this imbalance (three dozen hot cross buns later…). A few things to note about the recipe below. I bake mostly with spelt flour at the moment, so this recipe calls for spelt, though I’m sure it works just as well with plain flour. The roux method (also known as the tangzhong method) is great for bread baking when you want the end result to be very soft and fluffy. It’s truly well worth the effort of those few extra steps. And if you’re feeling adventurous, feel free to experiment with different glaze flavourings. Coffee or cola, anyone? For the roux, combine the spelt flour and water in a small saucepan. Stir over low heat until the mixture thickens and reaches a temperature of 65’C. Remove from the stove and scrape this into the bowl of your electric mixer. Mix in the cold milk. The resulting mixture should be at a barely-warm temperature. Stir in the dried yeast and allow to sit for a few minutes until it starts to bubble a little. Add the egg, followed by the flour, sugar, salt, spices, vanilla, dried fruit and unsalted butter. Knead this on a low speed until the dough comes together and looks smooth (about 5-6 minutes). Cover and allow to prove for an hour or until doubled. Transfer the dough onto your kitchen bench. Divide the dough into 12 pieces, each weighing 75-80g. Ball each piece and place them 1.5 inches apart on a lined baking tray. Cover with greased cling film and allow to prove until almost doubled in size (should take another hour). Before baking, make the cross paste out of flour, water and a pinch of sugar. The paste should be wet enough to pipe, but not runny. 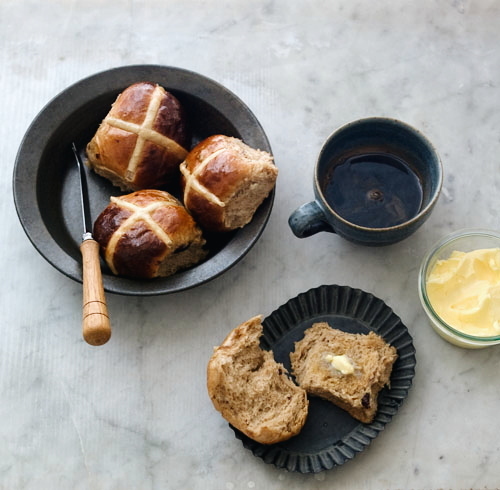 To bake the buns, brush them lightly with extra beaten egg, then pipe the crosses and bake in a preheated 190’C oven for 13-14 mins, rotating the tray half way through. If they sound hollow when tapped, then they’re done. While the buns are baking, prepare the glaze by bringing all the ingredients to a boil (to dissolve the sugar) and setting aside. When you take the buns out of the oven, brush them with the warm glaze and allow to cool. -The amount of dried fruit and spices you add to the dough is up to personal preference. -Omit the crosses if you dislike them. 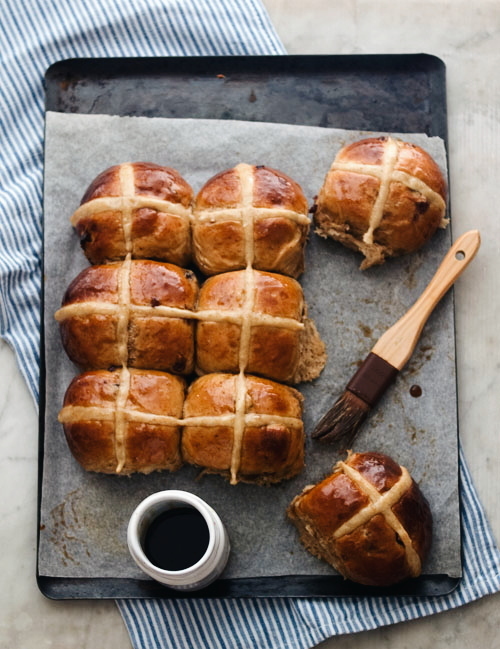 Beautiful hot cross buns! Very tempting. I am yet to consume any hot cross buns this year, but your post has certainly triggered an appetite for them! I love your different ideas for the glaze, too. Hi, Can I substitute dried yeast for fresh? If so, how much should I use? Hi Karen, you could try substituting with 16g of fresh yeast. Made these today exactly to recipe, except the dough was very sticky so added maybe 80g more flour until it was just workable. They are delicious, but when proving, mine doubled in width and not so much in height, so they are like discs of goodness rather than buns. My spelt flour is wholemeal…not sure if that’s what was used for this recipe? Lee : Hi! I used white spelt flour in this recipe. Wholemeal is a delicious alternative, but yes, it would change the consistency of the dough, and also affect gluten development, which would probably explain the problems you encountered. If you bake the wholemeal buns in a small pan, that could help contain the spreading upwards rather than sideways.